The career .251 hitter is due for some regression, but Semien has undeniably enjoyed a torrid first three weeks-plus to open the season. The 28-year-old now owns a seven-game hitting streak, and he's reached safely in 11 consecutive games overall. 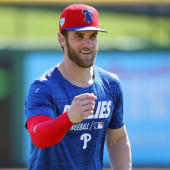 His two RBI on Sunday also give him seven over the last five contests, and he already boasts nine extra-base hits (six doubles, three home runs) over his first 83 plate appearances of 2019.